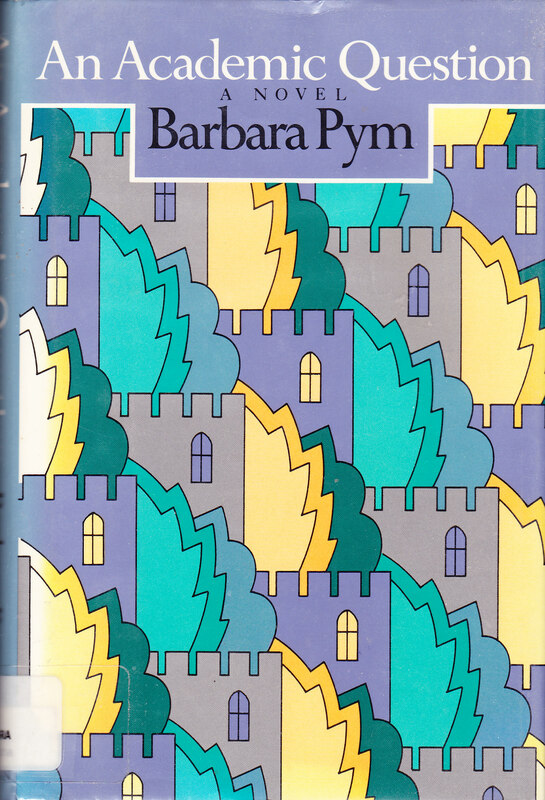 It is the centenary of Barbara Pym’s birth. I devoured Pym’s books in graduate school. 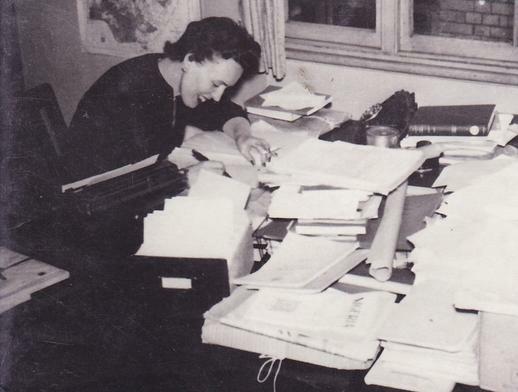 In 1977 in the TLS she was named by Philip Larkin and Lord David Cecil “the most underrated novelist of the century.” Then she was “rediscovered” in the UK and published in the U.S. I picked up a copy of Excellent Women at a used bookstore and was hooked. I wasn’t the only one who liked Pym: a comp lit professor and I chatted about her on smoking breaks. The library was so dreary–no windows above the second floor–that I frequently bounded down to the smoking lounge (though I didn’t smoke), which was all windows, for a chat or a good read of a new novel. One cannot read too much Pym. Her writing is charming, humorous, and wry. I read An Academic Question this week, but it’s not the only Pym I’ve read this year. On Feb. 11, I wrote about her witty, beautifully-crafted first novel, Some Tame Gazelle. The fiftysomething heroine, Belinda Bede, muses endlessly about clothes, to my delight: I muse more than I buy. Though she wears “suitable” dresses and sensible shoes, her younger sister Harriet reads Vogue and insists that Miss Prior, the village seamstress, make her fashionable dresses with the latest sleeves. They live next door to the vicarage and are constantly planning what to wear to church functions. And, yes, their names are puns: Bede and Prior. On Feb. 13 I wrote about her 1978 novel, The Sweet Dove Died. The heroine, Lenora Eyre, becomes involved with two antique dealers, an uncle and nephew, when she faints at an auction after buying a book about the language of flowers. The one is perhaps too old, the other too young: whom should she love? IPym’s tone is more whimsical and wry than Drabble’s, though this book is a bit like Drabble’s early comedies: Pym, too, is writing about a woman’s facing the widespread changes of the 1960s. The narrator, Caroline Grimstone, a 28-year-old housewife married to a university lecturer, is very bored. She knows she should get a job, but work strikes her as meaningless. Her husband, Alan, suggests she work at the library, but she would prefer to assist her her friend Dolly at her second-hand book and junk shop. Alan masterfully tells her that’s impossible with her education. Caroline’s best friend, Coco, Dolly’s brother, a handsome 42-year-old man with a research fellowship in Caribbean Studies and an interest in fashion, is closer to Caroline than her sister. He has his own idea about what bored Caroline should do. He suggests that she take a lover. The dialogue between them is hilarious. That’s what people do,” he said, as if I had no knowledge of the world. She takes Dolly’s more practical suggestion to volunteer to read aloud at an old people’s home. This becomes a hilarious opportunity for her husband to steal papers from the distinguished scholar Caroline reads to. He writes an article that becomes an object of contention between him and another scholar. It is such a funny, funny book: I did laugh aloud. But it also touches on issues of the ’60s and ’70s: the students at the university protest, and Caroline’s sister has an abortion. Alas, I won’t be there. This entry was tagged An Academic Question, Barbara Pym. Bookmark the permalink. I *do* love the Pym I have read this year, but ran out of steam a bit. Maybe you can have too much of a good thing – I think I’m not good at author read-alongs. I think I will return to her work again later! I have only read two Pym novels this year – A Glass of Blessings and Crampton Hodnet. Thanks, Kat, for the reminder that I need to get back to her world. Karen, I think it’s hard to read too many by one author in a row. You ARE good at readalongs. I’m always months behind. I know there was to be a Pym readalong, but I missed it. Belle, I took Crampton Hodnet off the shelf. I acquired it for $1 for a sale but have never read it. Thanks to you, too!